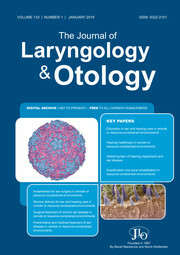 Mahmood Bhutta, Priya Carling, Matthew Clark,	The Journal of Laryngology & Otology, Volume 133 Issue 1, pp 1-2. M P A Clark, B D Westerberg, D Nakku, P Carling,	The Journal of Laryngology & Otology, Volume 133 Issue 1, pp 3-10. D Swanepoel, J L Clark,	The Journal of Laryngology & Otology, Volume 133 Issue 1, pp 11-17. K Graydon, C Waterworth, H Miller, H Gunasekera,	The Journal of Laryngology & Otology, Volume 133 Issue 1, pp 18-25. C Rutherford, L Petersen,	The Journal of Laryngology & Otology, Volume 133 Issue 1, pp 26-33. B Kaur, M P A Clark, J Lea,	The Journal of Laryngology & Otology, Volume 133 Issue 1, pp 34-38. M F Bhutta,	The Journal of Laryngology & Otology, Volume 133 Issue 1, pp 39-48. M C F Smith, C Huins, M Bhutta,	The Journal of Laryngology & Otology, Volume 133 Issue 1, pp 49-58. S Brophy-Williams, K Jarosz, J Sommer, A J Leach, P S Morris,	The Journal of Laryngology & Otology, Volume 133 Issue 1, pp 59-72.